Winter is officially here, and as the nights are drawing in and the weather starts to turn chilly, the best way to spend a dark Monday night is with some rich and tasty comfort food. I conjured up this dish with what was left in the fridge. The flavours compliment each other well: the sweet and indulgent creamy sauce is offset by the inclusion of green vegetables for a little bit of a naughty, but nice, autumnal pasta dish. I first tried orzo while I was volunteering at a homeless shelter a couple of years ago as it was donated by the vatful. I couldn’t believe this gigantic looking rice was in fact pasta: ‘liney pasta’ I like to call it. It’s so easy to prepare and makes a nice change to everyday pasta shapes, for a risotto-like presentation. For a veggie friendly version, simply leave out the prawns. 1. Chop the asparagus spears into thirds and put them on a baking tray. Place them under the grill on a medium heat for 5-10 minutes, rotating every now and again so they cook evenly. 2. Put the kettle on to boil. While it’s boiling, place a medium to large frying pan on the hob on a medium heat. Pour in the olive oil and leave to heat up. When the kettle’s boiled, pour it into a medium sized saucepan and bring to the boil on the hob. 3. Meanwhile, slice the leek into 3-4 centimetre rounds. Using your hands, push the individual ribbons out of each slice and wash under the tap. Lift the frying pan up and tilt it in a circular motion to distribute the oil evenly. Add the leeks and fry until soft, stirring occasionally. 4. When the water is boiling, add the orzo and cook on a high heat for 10-12 minutes, or until shiny and soft. 5. Pour the cream into the frying pan and reduce the heat slightly, mixing the liquid in with the leek. Add the garlic and rosemary and cook for five minutes, stirring frequently. When the cream has thinned slightly, add the prawns and lemon juice and cook for a further five minutes. 6. 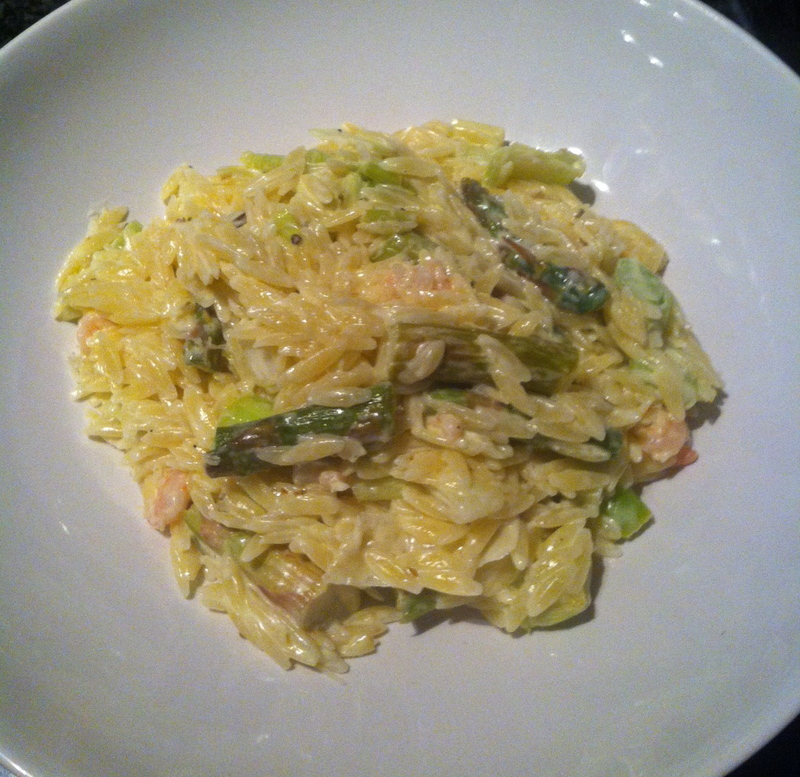 When the asparagus has softened, take it out of the grill and add to the creamy mixture. 7. Grate the cheese finely and add it to the frying pan, holding a little bit back for decoration. 8. When the orzo is ready, drain it and add it to the creamy mixture. Stir the ingredients in together well and cook for a couple of minutes, until they are well combined. 9. Add salt and pepper to taste and serve in a bowl with a sprinkling of cheese on top.